Downsizing has been around for a while. While it spans different industries, its meaning is relatively universal, and it's the basis for an SEO success story. For Treplus Communities, builders of active senior, 55+ communities, it's about scaled-back living in luxury apartments with condo quality features and fixtures. There's even an organization called Downsize Columbus, whose goal is to assist individual who are scaling back, addressing the transitional areas of Residential, Emotional, Legal, Medical and Financial. 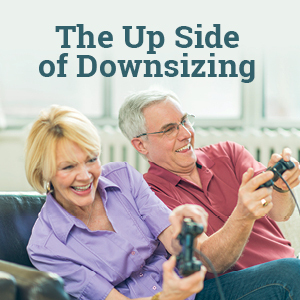 The word "downsizing" has become a lexicon in our cumulative vocabulary. It's a word common enough in our language that it's become a keyword in the online searches of people looking to start a simpler stage of life. So the phrase "downsizing" became a cornerstone of our keyword focus when we designed, wrote and built, Treplus Communities' website in the summer of 2017. Then, in December of 2017, Matt Damon's movie "Downsizing" came out. When the Matt Damon movie came out, any search for the word "downsizing" showed links for the movie. It took over every result on page 1 of a Google search. And page 2. And page 3. At the time we were worried. We thought about moving away from the word "downsizing" and focusing more on the other main keywords: "senior apartments" and "luxury apartments." After all, there was no way we'd ever get Treplus to show up on page 1 of a Google search for "downsizing." Not any more. So what do you to when you're a Columbus website design firm and SEO agency, and your client's SEO has been compromised by Matt Damon? How this became an alternative SEO success story. Turns out, things actually worked in our (or should we say, Treplus') favor. It became obvious to anyone searching "downsizing," and NOT looking for the movie, they had to expand their keyword choices. If people were looking for information about downsizing, and searching for a place to live, they had to combine search terms. In addition to the word "downsizing," they found they had to add words like "senior apartments," "luxury apartments," or "condos" to find the 55+ communities they were looking for. And that's where Treplus Communities benefited. All along, we'd also been using the keywords "senior apartments," "luxury apartments," and "condos." So when someone searched for the combined keywords "downsizing" and "luxury apartments," Treplus was perfectly positioned to dominate the results on page 1 of that Google search. The combination of keywords "downsizing + senior apartments" and "downsizing + luxury apartments" had been part of their keyword strategy from the start. So when those two keywords were combined, Treplus was perfectly positioned to show up all over page 1. See the search results for the keywords "downsizing luxury apartments" here. Looking back, turns out the Matt Damon movie did us a favor. It forced people looking to downsize and move to a smaller place, to use the perfect combination of keywords that Treplus' website was built around: "downsizing + senior apartments" and "downsizing + luxury apartments." It didn't even matter if someone added the words "Columbus," "or "Columbus Ohio" to their search. With, or without, the location, web browsers, and Google, knows where you're searching from, and will return results based on their proximity to your location. You can see the search results below, shown as screen shots, for how well Treplus Communities showed up in searches for those combination of keywords. See the search results for "downsizing senior apartments" here. Search results for "Downsizing luxury apartments" in Google. search reSults for "downsizing senior apartments"